A few days later, the hotel’s general manager responded to Susan’s complaints via email, seeming to acknowledge the existence of a problem. “Unfortunately they [bed bugs] have become a major problem throughout European and US hotels in recent years,” he wrote, “and we look to have fallen victim to them.” The general manager promised to “assess the pest control contractor’s findings in the morning and contact you in the afternoon”. She never heard from him again. So Susan turned to TripAdvisor, the hotel-review website that allows customers share their experiences at more than 116,000 destinations worldwide. With 200 million unique visits per month, TripAdvisor’s clout in the hospitality sector is unrivalled. But the website is loathed as much as it is loved. Critics point out that it makes little effort to authenticate the user-submitted reviews it publishes, leaving hotels vulnerable to malicious attacks by business rivals or embittered former employees. As TripAdvisor announced the publication of its 100 millionth user-submitted review last month, photographer Kathrin Baumbach and I decided to spend a night in some of Ireland’s more colourfully reviewed hotels. We would travel incognito and judge for ourselves if the criticism these establishments receive is really warranted. Lynam’s is not TripAdvisor’s worst reviewed Dublin hotel. But this “engaging boutique hotel” (self-described) rocketed to our attention courtesy of a series of spectacular complaints posted in recent months, including four of bed bugs, one of a fire alarm repeatedly going off in the middle of the night and one user-submitted photo of a syringe discarded in a drain outside a fourth-floor bedroom window. Kathrin has booked us a double room, at €60 for the night. We’re posing as a tourist couple, the clandestine nature of the assignment almost making up for the hotel’s definite lack of razzmatazz. I arrive early and tell the receptionist my wife has made a reservation. It’s exciting. I feel like the Scarlet Pimpernel. “Your wife’s surname?” the receptionist asks. Well, strike one against the Pimpernel. I take the elevator up three floors and shuffle around a series of poky corridors before finding the correct room. I coax the lock open with the cut key provided and step inside. There are two decent-sized beds. A table, chest of drawers and a pair of dog-earred armchairs account for most of the remaining floor space. It’s rough and ready, but no more so than you’d expect for budget accommodation in the city centre. When Kathrin arrives, she looks the place over with a slightly more jaundiced eye. 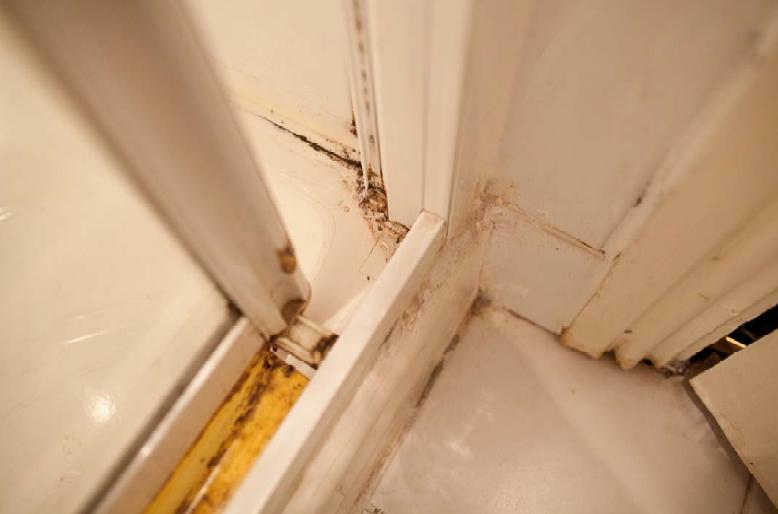 She points to significant mould growth on the curtains, windowsills, in the shower and on the bathroom roof. Well, if you’re going to start being fussy, I suppose. The window overlooks a gutter filled with moss, discarded cigarette butts and about four inches of stagnant water. There aren’t any syringes that I can see, but the gutter does seem to match the one in the photograph. In the alley below, two drug addicts are foraging in wheelie bins. If it’s an authentic inner-city experience you’re after, this place doesn’t disappoint. We dump our bags and head downstairs for dinner in Café Carlo. The reception desk is unmanned as we pass and the lift and stairs are unguarded. It does seem plausible that a non-resident drug addict might slip past and make their way upstairs to an unoccupied room without being noticed. The restaurant staff are friendly, service is prompt and the decor tasteful. But it’s hard to ignore the visible plume of smoke, and scent of burning meat, that permeates the unventilated dining area. I order a chargrilled chicken fillet for €10. It comes with chips and a side salad. Kathrin orders a Margherita pizza for €9. The food is nothing spectacular, but it’s fine. I ask Kathrin about her work. She photographs musicians mostly, she says. She reckons the Irish rock scene is very vibrant, very exciting. Well, she is from Germany, I suppose. The 24-hour residents’ bar advertised on the hotel’s website does not exist. So after dinner, we head next door to Dr Quirkey’s Goodtime Emporium to kill a bit of time. First, Kathrin trounces me at basketball. Then we pour about a fiver’s worth of 20c coins into a gaming machine. Eventually, a light flashes to inform us we’ve won a mystery prize. That mystery prize turns out to be a 20c coin. Deciding that’s enough excitement for one evening, we retire to our room. I’ve begun to feel rather antsy – if that’s not an unfortunate choice of words – concerning where we’re about to spend the night. By now I’ve had time to google ‘bed bugs symptoms’ on my phone and the results (‘skin rashes, psychological effects, allergic symptoms’) are beginning to test my resolve. We decide to inspect the beds. I strip the sheets from Kathrin’s double bed. They seem clean, but the mattress underneath is badly stained. My own mattress is okay. I don’t spot any bed bugs, but then I’m not really too sure what they look like in the first place. It is at this point that I hit upon the idea of trying to contact one of the TripAdvisor users whose reviews of this hotel inspired us to visit. I send Susan O’Donoghue a private message via TripAdvisor and she agrees to speak to me on the phone. She tells me that she and her husband stayed here in November 2012, when they were in Dublin to see comedian Michael McIntyre at the O2. They are not usually fussy people, she stresses. Thankfully, I’m not ravaged by bed bugs, but I do end up sleeping fully clothed, with a spare pair of socks covering my hands. My bed has no headboard and the pillows are paper thin. I have bad dreams. The next morning, we rise early and have breakfasts at Café Carlo. The Full Irish is delicious and excellent value at only €5. But I don’t have time to enjoy it. I have a date with a hot shower. Lynam’s general manager acknowledges the hotel has had a problem with bed bugs, but is currently certified free of them. He states that the hotel cannot be held responsible for what guests get up to in the hotel bedrooms. He does not believe that non-guests could gain access to these rooms as the front desk is always attended. The hotel employee who left the front desk unattended during our visit is being reprimanded. 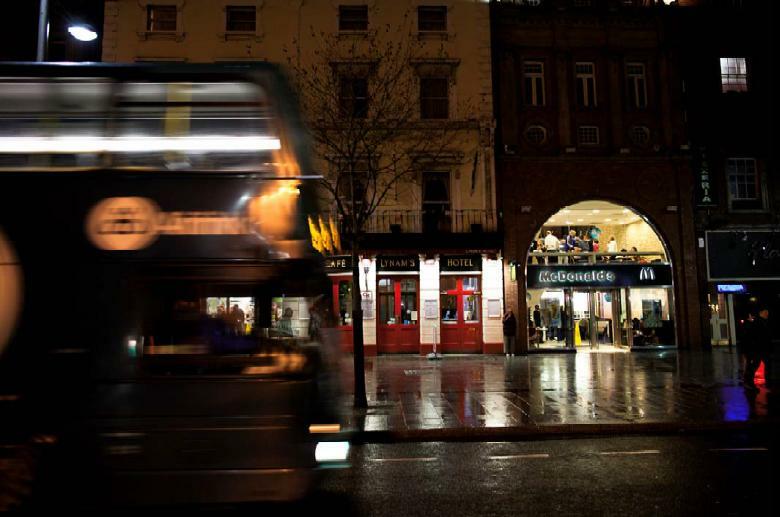 It’s 8.05pm on a Thursday evening and a hard rain is lashing down on the Belfast Road. After driving around in circles for about 20 minutes, we finally pull up to a halt in the vast, empty car park of the Mourne Country Hotel. From this angle, you’d scarcely guess that the building in front of us was inhabited, let alone that it was a hotel. It looks more like a dilapidated meat factory or a rogue cluster of abandoned parochial halls. We grab our bags, pull our jackets over our heads and make a run for it. Inside, the reception area is modern, spacious and brightly lit – but deserted. Long corridors unfold away in either direction. There is an empty bar, an empty restaurant and a faint but omnipresent droning noise. It’s like the bridge of the Mary Celeste, or the Red Dwarf. The restaurant is officially closed, but I ask if it might be possible to get a late bite to eat. The receptionist smiles and assures us it won’t be a problem. Then she vanishes as abruptly as she appeared. We take a seat in the bar and sit there for another while, wondering if anyone is going to take our order. While we wait, I quiz Kathrin about David Hasselhoff, who I’m reliably informed is a musical superstar in her country. “Why do Irish people always say this?” she sighs. “You think David Hasselhoff is a musical god in Germany. It’s not true.” I apologise for bringing up what is obviously a touchy subject. Eventually, the receptionist pops up again, this time brandishing menus. Kathrin goes for pasta. I opt for a jacket potato and salad. “Do you think she’s going to cook the food herself?” I whisper. Kathrin smirks. Probably. Whoever is responsible, the food is really excellent when it arrives. The best and the cheapest we’ve had on this trip by a country mile. We talk a little more about the German music scene. Under cross examination, Kathrin admits to having owned two David Hasselhoff albums when she was younger. But she really doesn’t see what that has to do with anything. This is fun, a lot more fun than yesterday. By the time we retire for the night, I notice that tomorrow’s ‘continental breakfast’ of sliced pan, cereal, tea bags and orange juice is already laid out for the morning. Kathrin is from the continent, but this isn’t ringing many bells with her either. We may be the only guests staying tonight, however, so we decide to let it slide. Our rooms are both located on the north wing, which appears to lack working central heating. There are storage heaters running but, on one of the most unseasonably cold nights of the year, they aren’t remotely effective. I try reading, but it’s too cold to sit anywhere other than right up against the storage heater, and that corner is in shade. There’s the makings of a cup of tea on the table. But there’s only one plug socket, so I have to turn off the TV to plug in the kettle. In the morning, the roads and surrounding hills are covered in snow. I inform the new receptionist that there is no hot water in my room. She insists that there is. No, I assure her, there definitely isn’t. I ran the shower in my room for several minutes. It was stone cold. Kathrin did likewise. The receptionist shrugs and says she just washed her hands in the back office and the water was warm. The manager of the Mourne Country Hotel explains that the hotel is in the process of being modernised. The hotel foyer is complete. The rooms are in the process of being upgraded, with the car park due for revamping in the next phase of the project. She apologises unreservedly for the shortcomings we experienced with hot water, blaming it on an “oversight by contractors working within the hotel”. This former RIC barracks once housed a prison in the basement: present management are hoping guests will stay over voluntarily. 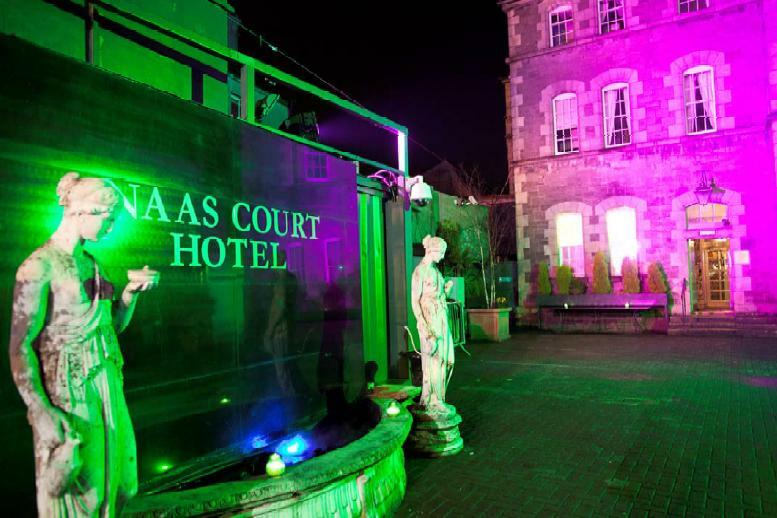 We’ve booked two single rooms at the Naas Court Hotel tonight, at €50 a pop. There’s no parking in the courtyard, so I’m forced to find a spot out on the street. We walk through the front door and nose about looking for a reception desk. There doesn’t seem to be one. We venture right, into a gleaming horseshoe bar. That’s also deserted. Then we hear music coming from an adjoining room beyond. It’s a large bar, surrounded by a spacious modern lounge and dance floor. An old man, perched on a barstool, is sipping a pint. Slightly above him, in an elevated booth, a DJ is busy at work. There is chart music blaring through speakers, while a disco ball sends light cascading across the walls and ceiling. The room is otherwise completely empty. We take a seat at the bar in this deserted disco, drop our bags and wait for a member of staff to come to our assistance. After a couple of minutes, the old man next to us finally speaks up. “That’s the fella you’re lookin’ for,” he says, nodding toward the DJ. We traipse around to him and manage to get the DJ’s attention. He finds our reservation and hands us a couple of keys. We ask if the hotel serves food. He says no. We ask if there’s anywhere nearby we could eat. He says yes. We ask if there’s somewhere in particular he’d care to recommend? “Depends what you’re looking for,” he says. The Naas Court Hotel’s staff have been criticised on TripAdvisor for poor customer relations. I wouldn’t say that this staff member is unfriendly, per se, but he’s not being excessively helpful either. We trudge up the stairs, through a thick, locked metal door and on to our rooms. And what rooms. Clean! Comfortable! Enormous beds! Flatscreen TVs! Kathrin has a chandelier! I have a Jacuzzi bath! Compared to last night, we’ve landed in Shangri-La. Kathrin again conducts her own, more forensic examination of the place. She discovers a tiny yellow stain on the carpeted floor. Who cares? I’ve got the P Diddy Suite. After dinner in a nearby restaurant, Kathrin returns to the hotel. I hang back for a drink in one of the local bars. One TripAdvisor user complained that the Naas Court Hotel attempted to charge them for entry to the nightclub when he returned to his accommodation late. I want to see if that happens to me. It’s after 11pm when I get back. I’m not sure if the bouncer remembers me from earlier, or I’m just self-evidently a 34-year-old man who hasn’t been inside a nightclub voluntarily for over a decade. Either way, I’m permitted to enter without any trouble. Inside, the nightclub is about half full. Two karaoke professionals are ripping through a Jason Mraz cover. When they finish, they look for volunteers from the audience to come up and have a go. After a bit of cajoling, a young man steps up to sing Ewan MacColl’s ‘Dirty Old Town’. As I explore the ground floor and the extensive outside smoking area, it becomes apparent why the metal door at the top of the stairs is locked. It’s to prevent revellers from wandering upstairs into the guest rooms. 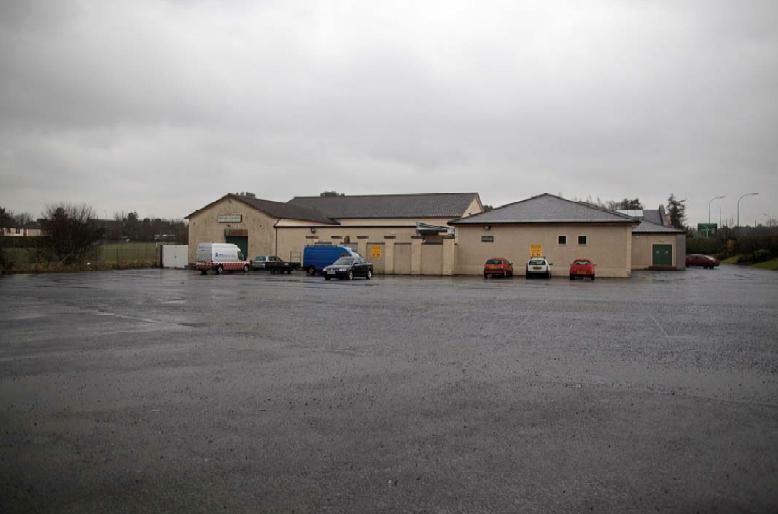 The Naas Court isn’t so much a hotel, it seems, as a giant nightclub with bedrooms. Back inside, the barman pours me a drink. Relieved of his DJing duties, he’s actually quite a friendly guy. He tells me this is a quiet night, by the venue’s standards. The Wednesday after a bank holiday, he explains, is about as quiet as it gets around here. If I happened to be here later in the week, things would be a lot more raucous. At midnight, I decide to turn in. I mention to the barman that I had trouble opening the locked metal door at the top of the stairs earlier. He insists on sending a younger member of staff with me to make sure I get to my room okay. It’s a nice gesture. At this point, I’m tempted to log on to TripAdvisor and post a glowing review of this place myself. Unfortunately, there’s a kicker. Even from my bedroom on the second floor, the noise from downstairs is undoubtedly bothersome. I try lying with the pillow over my ears, but the bass is still audible and I’m unable to sleep. In the end, I decide to get up and run the Jacuzzi bath. To hell with it, if I’m going to be awake, I might as well make use of the facilities. At 8.30am, five-and-a-half hours after I finally get to sleep, I have to get up to put a ticket on my car, so that it isn’t clamped outside on the street. When I return to the hotel, the front door is locked. I have to ring a bell to be readmitted. I inquire about breakfast and am directed to the recently vacated nightclub. This is another TripAdvisor complaint that has proven to be accurate. Breakfast is served in the very same space where a large crowd of people were drinking and dancing only a few hours earlier. Right now, the place smells only faintly of stale beer. However, in the aftermath of a busier night – had someone vomited, say, and a heavier disinfectant been required to clean it up – I don’t imagine this would be a very pleasant way for guests to start their day. We pay our bill and hit the road. The Naas Court Hotel was invited to comment on this article but declined to do so. Of the hotels we’ve stayed in this week, none of them have been perfect. Most of the criticism they received on TripAdvisor was fair. Some of it wasn’t. But all three hotels are managing to keep their heads above water in the midst of a devastating recession, so I would bare that in mind before judging them too harshly. The only common complaint on Trip-Advisor that we never experienced for ourselves in any of the hotels we visited was rudeness from staff. Which seems to suggest that, when the chips are down – damnit, when the chips are inedible – a little patience and good humour goes a long way. We stay at a lot of hotels and while some of the complaints on Trip Advisor are justified, many are people who expect 4-star hotels at 2-star prices. And I suspect some just like being sarky online. I ignore most comments if they sound “clever” or unduly witty, because there’s a good chance the complainant just likes the sound of his own voice.